Gadsisar Lake is actually a water conservation tank, made by the then maharaja of Jaisalmer, Maharwal Gadsi Singh around 1400 A.D. The architecture of the monuments and town planning of nearly places in Rajasthan, Jaipur and Jaisalmer just to name two, points to the progressive temperament and the high level knowledge of the rulers and builders of the time. Gadsisar Lake is another example of the same. 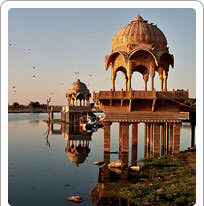 The lake is surrounded by various temples that are reflected in the calm waters and add to its beauty. A beautiful gateway arching across the road down to the Lake was built by a royal courtesan named Tillon. It is known as Tillon Ki Pol (Gate of Tillon). Lord Vishnu's statue was installed in the year 1908 A.D.
As the lake is close to Bharatpur, migratory birds are often found at this location as well. Carry your camera with you to take beautiful pictures.